Kochi:Kajaria Ceramics Limited, the No. 1 tile company in India and 14th in World is known to nurture its dealers. And now it has created a new benchmark in southern region by awarding premium cars like Audi & Mercedes to its 29 dealers in Kerala, all to appreciate and reward their outstanding performance, undaunting hard work and dedication. Southern India has always been a strong market for Kajaria, and recently it has become one of the top performing markets. With this magnificent gesture, the bond shared by Kajaria and the dealers have strengthened even more . On this grand occasion, Mr. Rishi Kajaria, JMD, Kajaria Ceramics Limited also announced the start of a new manufacturing plant of polished vitrified tiles in Andhra Pradesh. This plant will cater to the southern region, which he said would be functional by 2017. In his short speech he appreciated the modern thinking of people of southern region, especially people of Kerala which is the most popular tourism destination and known as god's own country. He said that "the market of Kerala adapts to fresh changes very quickly. For us, it is very exciting to launch any new product of the international category here, as people are more exposed to international markets, and have very flexible thinking". 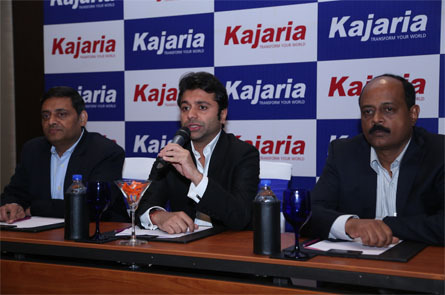 Kajaria is growing at a tremendous pace in India, and within a short span it has become the No. 1 tile company of India, with 8 manufacturing facilities across the country. Apart from its new plant in Andhra Pradesh, the company is adding another manufacturing facility in Virat Nagar, Rajasthan, which will be operational by next month. Kajaria is further strengthening its forte in the region; and it also plans to expand their display centre & showroom networks to enhance the customer experience. To complete itself as a total bathroom solution provider, it has launched a range of beautiful faucets under its bathroom brand KEROVIT in July this year. 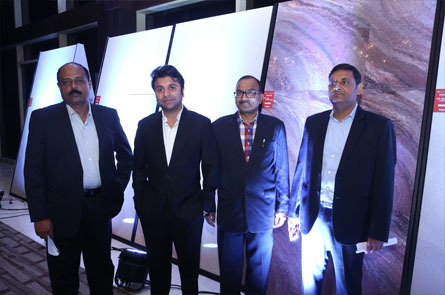 Mr. Rishi Kajaria Unveiled two new ranges of tile designs in solitaire series of size 80x80 in the Function. Kajaria have 30 percentage market Share in Kerala.